People sometimes drink apple cider vinegar mixed with water in an attempt to lose weight, cleanse their bodies of toxins, lower their blood sugar levels or treat infections. Research results aren't conclusive enough to support these uses, and there are potential adverse effects from drinking apple cider vinegar. Talk with your doctor before using apple cider vinegar in amounts larger than those typically found in foods. Following the apple cider vinegar diet means drinking up to a tablespoon of apple cider vinegar mixed with a glass of water before each meal. In addition, dieters skip snacks and eat moderately sized portions. The vinegar is supposed to make the dieter feel less hungry and make it easier to avoid snacking. Proponents of this diet claim that apple cider vinegar burns fat and limits your appetite. They also claim that a type of fiber found in apples, called pectin, may help increase weight loss. However, an article published in August 2010 on the Columbia Health website notes that vinegar doesn't seem to affect fat, but that it may temporarily decrease water weight. 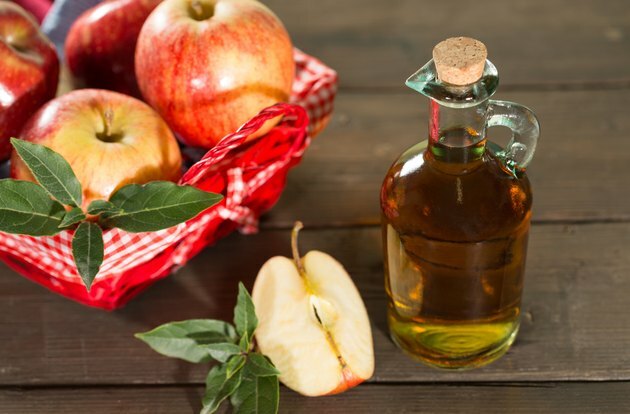 Apple cider vinegar hasn't been well-studied in terms of its potential for weight loss, according to a 2011 review article published in "American Family Physician." Small studies have shown that consuming vinegar before or during meals may help people feel fuller after the meal and eat fewer calories at subsequent meals, possibly due to decreases in blood sugar, according to a review article published in "Medscape General Medicine" in 2006. However, not all studies have shown the same effects. Whether the effects of apple cider vinegar are strong enough to lead to actual weight loss isn't clear. As for eliminating toxins, there's no scientific evidence that detox diets help increase the elimination of toxins or give you more energy, according to the TeensHealth website. You body uses your kidneys and liver to remove toxins. Drinking apple cider vinegar isn't risk-free. It can irritate your throat and stomach, and if you drink large amounts for an extended time it could cause a potassium deficiency. The acidity of vinegar can damage the enamel of your teeth. Vinegar also interacts with certain medications, including diuretics, blood thinners and insulin, so it may not be safe for people on these medications.